Over the weekend, UFC president Dana White sent ripples throughout the light heavyweight division when he revealed reigning king Jon Jones was prepared to end his vacation early and defend his throne. 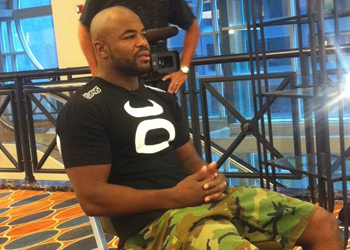 Although Rashad Evans (Pictured) has been next in line for a shot at the crown for what seems to be an eternity, White suggested a certain former Strikeforce champion could leapfrog Evans because of timing. “[Jones] said he wanted to take all this time off and then [Jones’ representatives] were calling me four days ago saying he wants to fight as soon as possible,” White told ESPN 1100 in Las Vegas. However, during Tuesday’s edition of The Jim Rome Show, it appears White has decided to stick to the script and go with the latter option. “We’re working on it now,” White said of Jones’ next opponent. “We’re going to obviously see what happens in this Rashad fight at the end of the month. The next fight on FOX, Rashad is fighting [Phil] Davis, so we’ll see what happens there. Evans looks to solidify his top contender status on January 28th. If he can hand “Mr. Wonderful” his first professional blemish and leave the scrap unscathed, which are both far from certainties, fans may finally be treated to the biggest grudge match in the 205-pound division.